Q: I have a paper and/or report for school. Will you do it for me or give me any more information? A: Visit your local library or other Internet sites, this site does not give any more than what you already see. Q: Is Joan Herriot still alive? A: No, she passed away July 14, 1999. Q: How can I contact James Herriot? 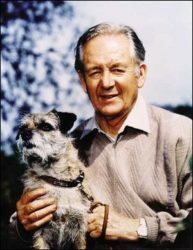 A: Sadly, James Herriot passed away some time ago. You could contact the publisher if you wish to contact any of his family.